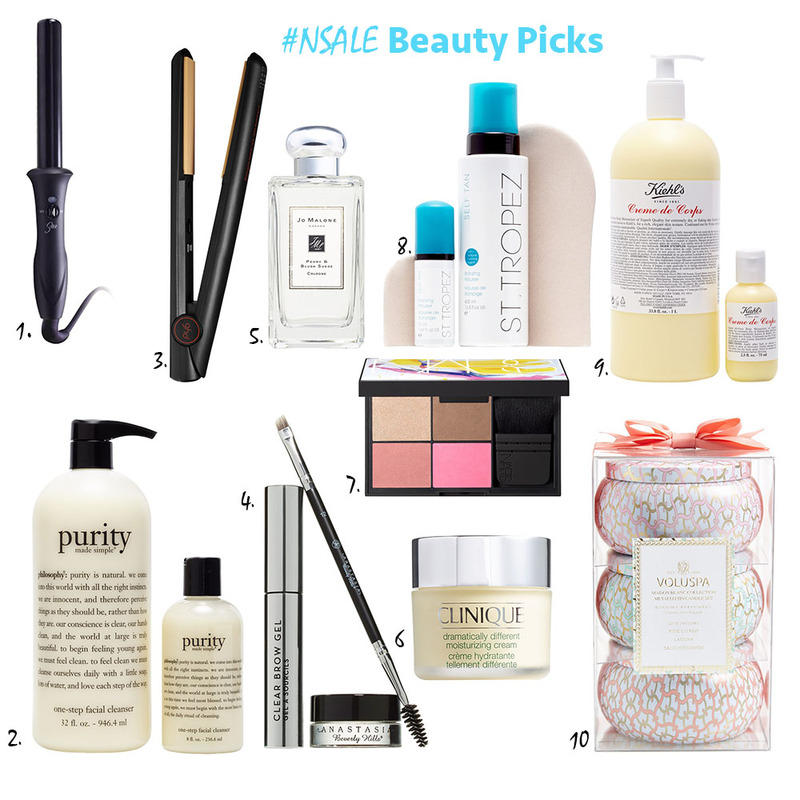 In honor of the last 3 DAYS of the Nordstrom Anniversary Sale, I wanted to share my top beauty pics included in the sale. It was hard to pick my "Top 10" because there are so many great steals! I couldn't imagine life without any of these products. Hurry up and make your final purchases before they go back to full price! HAIR: The Sultra Curling Wand is my go-to for the perfect loose, beach wave. They call it "The Bombshell" for a reason! Curl your hair in sections with the wand and spray before and after with Oribe dry texturing spray for an effortlessly flawless look. When it comes to choosing a good straightener, you can't go wrong with ghd. They always use the best quality ceramic, leaving your hair silky and shiny. SKINCARE: I use the Purity face wash religiously. Morning and night, I don't even share with my boyfriend, it's THAT GOOD. The first thing I do after removing my excess makeup is put on this amazing Clinique moisturizing cream on my face. It's a great cream for night because it really soaks into your skin, leaving you feeling refreshed and hydrated when you wake up in the morning. When it comes to choosing an all over killer body lotion, Kiehls Creme de Corps is like silk in a bottle. The rich non-greasy formula is comparable to magic for your skin. Last but certainly not least, BRONZE. St. Tropez is hands down, the best at home tanning lotion. Period. MAKEUP: Don't worry about me, worry about your brows. Ladies, if you don't have a good brow kit, what are you waiting for??? Anastasia Beverly Hills is known for their brow products, and the brow studio set is the perfect way to step up your brow game. Brows aren't complete without some perfectly sculpted cheekbones. Use the Nars cheek palette to contour and highlight your cheeks. Oh and did I mention that the kit comes with a mini Kabuki Ita brush?!?! SCENTS: Every girl needs at least one Jo Malone fragrance at home. Peony and Blush Suede smells like heaven in a bottle. If your not sold yet, just check out the scent description, "Jo Malone Peony and Blush Suede Cologne features a charming mix of peonies, red apple, jasmine, rose and gillyflower, all mingling with a sensual blush suede". WHOA. Now you can't stop the scent party there, your house also needs some love. Grab a three pack of the Voluspa candles and you will be set for a few months. Okay, so today I wanted to talk about bar carts, yes bar carts. You may be thinking... why would I need a bar cart when I have a perfectly good cabinet or pantry at home? Just trust me on this, you NEED one. They are such a great addition to any home and pretty much a necessity IMO. One of the first rules of entertaining is having an ample amount of drink options to offer your guests! I mean, what kind of host invites people over and doesn't have a variety of libations? A BAD one... Let's face it, it's hard to appeal to everyone with just one drink option. This is why you need the all-encompassing bar cart, fully stocked, to be the ultimate host. 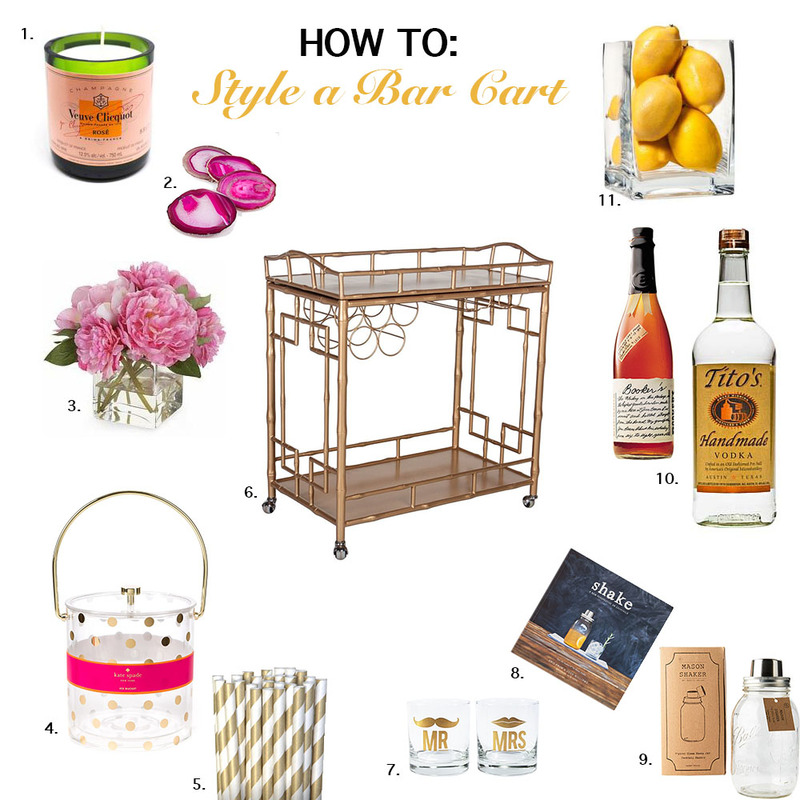 Step 1: Find the right bar cart for your home. When it comes to choosing the perfect bar cart, you need to set a budget. The Society Social cart featured above is GORGEOUS, but may exceed some people's budget. Target offers a great gold and wooden bar cart that is to-die-for (and is only $130!). For my crafty readers- you can also make a DIY one as well (future post coming soon). Step 2: Accessorize. Nowadays, bar carts aren't just about the liquor stocked on them. It is also equally important to style it in a way that is aesthetically appealing. The overall theme of your cart should match your style. We all have a personal brand, make sure your cart reflects that! Remember, all the little details matter, from the straws, to the glasses, to the coasters you serve them on. Having the right accessories will create the ultimate at home bar experience and will leave your guests in envy (wishing they had an equally fabulous bar cart). Step 3: Stock the cart. Duh. BUT, I'm not just talking about liquor here. It is just as essential to have the right mixers, fruits, and garnishes. How are you going to offer fresh mint mojitos w/o the mint?! A cart should always have bitters, simple syrup, Pellegrino, and fruit (lemons/limes/oranges). If you're feeling really crazy, you can even fill a cute bowl with nuts. Game changer, I know. Last but not least, a cocktail recipe book for when you get a brain freeze on what drinks to serve up. Now grab a shaker and get mixing! Happy Monday! In light of the Nordstrom Half Yearly Sale, I wanted to share a few of my favorite items I purchased. This WHITE CHAMBRAY shirt is such a steal and is so SOFT. It comes in three different colors and will be a great blouse for the fall. I purchased the small for a looser fit. I also bought this gorgeous Marc Jacobs crossbody bag at the #NSALE. It is a nice black leather and is very sleek, perfect for any occasion. Another favorite sale item from Nordies that I picked up was the 3 pack of Voluspa candles for only $30! When I get home from work, the first thing I do is light my Voluspa candle, pour myself a glass of Tazo Passion Tea and turn on the 6:00 news. What can I say, I'm a creature of habit. Anyways, these candles will make you feel like you are in your own personal oasis, I promise. Hope everyone had a fabulous weekend. Mine consisted of Saturday brunch with my girls, dinner with my boyfriend's parents, and the usual, mondane Sunday grocery shopping/prep for the work week ahead. Welcome to The Blushing Bella! I have had this blog in the works for months now, and everything has finally come together so perfectly. Turning my blogging dreams into a reality is so surreal. Thank you to everyone for stopping by. 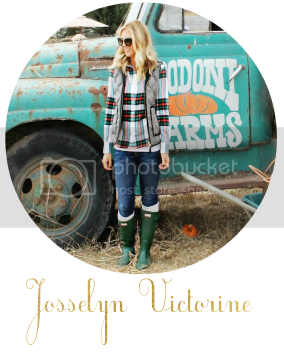 Who is Josselyn Victorine? I am a sunshine loving, high tech working, lipstick wearing, chardonnay sipping, young professional with a passion for fitness, fashion, and all things pretty. Learn more about me here or feel free to reach out to me directly! What can you expect out of this blog? My blog will have a little bit of everything with a focus on style, beauty tips & tricks, and my day-to-day lifestyle how-to's (recipes, workouts, house decor etc). For my first post, I wanted to share my all time favorite MAXI dress. It comes in so many different colors (I also have the black and the bright coral). This dress is so comfy that I sometimes feel guilty wearing it out, because it's so soft and flowy that it reminds me of pajamas! It is a summer must-have and is so versatile. It can be dressed up or down. Throw it on with your favorite flats and side bag for HH with friends or wear it Saturday morning with a jean jacket to farmers market with your boo.